All clients want their 15 minutes in the spotlight. Often it comes in the form of an article or a press interview, but it can also come in the form of speaking engagements. However, it’s is often up to us PR practitioners to make that on-stage opportunity happen. While it’s not always easy, it is possible to see regular success in a speaking program. Here are five points to keep top of mind for your event speaking strategy. There are countless events, covering even more topics. Meaning there is a lot of noise in the events market. As you’re digging into specific events, do your due diligence in understanding who the event targets. One of the worst things you can do for a client is put a CEO on stage at an event where the audience is nowhere near their core customer base. You then have a client that invested a lot of time, and often money, into a presentation that has no benefit for their business. Does the audience include appropriate decision makers? Is there an opportunity to meet with relevant media and analysts at the show? Also, make sure the topic you’re nominating will resonate with the event audience. Clients can even use their customers as a focus group for this, by asking what pain points they’d like to see covered for specific topics. Understanding how your client best shares their story is key to knowing how to position them in the nomination process. This will help you to categorize their presentation appropriately. If the presenter does not easily speak to a large room, a round table or breakout session would be a better option for them. Keeping personality traits in mind will make sure your presenter is comfortable in the environment they’re presenting in. And, although it should go without saying (but we’ll say it anyway), make sure the presenter’s title and the opportunity and topic are appropriately aligned. For instance, you wouldn’t want to put a CMO on a panel discussing engineering best practices, nor would you want to put an engineer in a keynote session discussing business impact, or in general pitch a CEO on a round-table with a number of mid-level executives. Also, use this opportunity to learn their recommendations to make your nomination stand out. They might suggest including a video of a previous presentation or a ranking of the proposed speaker’s social and industry influence. In recent years, we’ve seen videos become a bigger part of speaking submissions and have assisted a number of clients with developing videos and producing submissions through our award-winning Pro-Motion Studios. As well, keep in mind that event organizers are looking for impactful, educational content. So, leave the sales pitch at home, and speak to industry-wide topics that are vendor neutral. It seems pretty obvious, but deadlines are the one thing that determines whether or not your nomination will even be considered. Conferences have extremely long lead times on speaker nominations, and the larger the event, the longer the lead time. Just as an example, SXSW in Austin, TX, closes nomination in July for the Interactive conference that takes place the following March. That’s a full nine months in advance. Strata New York closes their call for speakers six months in advance, as does RSA. However, if your nomination does not get chosen, stay in touch with the event content organizers. A speaker might drop out at the last minute, leaving a hole in the agenda that will need to be filled quickly, and they’ll look to speakers and nominators that have been engaged with them throughout the nomination process. Additionally, keep your client’s internal calendar in mind and work with them to prioritize nomination deadlines with their own user and customer conferences and internal board meetings. While we’d all like to position our clients for free, that’s not the only way for clients to get their message out. Sponsored panels and sessions at key events are still an excellent way to position clients and enable them to communicate directly with their target audience as well as network with fellow peers and presenters. Executive feature at the event. 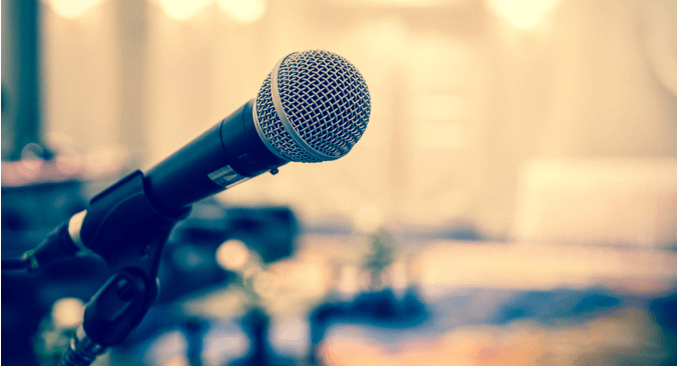 With the right person presenting on the topic that resonates with the event audience, 15-minutes in the spotlight can turn into countless sales leads and industry influence. We’ve used these five points to secure presentations for our clients time and time again and now you can, too.